To Infinity (Scarf) and Beyond! With my first holiday artisan's market only one month away (Lindbergh Holiday Boutique in Dearborn, MI on November 10), I am trying very hard to work on my inventory. Infinity scarves seem to be a very popular item this season, so I made another one this week. Quite a different style than the one featured in last week's blog. While that one was gossamer light, this one was created with a warm, chunky weight yarn in a gorgeous shade of plummy purple. The yarn is scattered with sequins in the same color, and they catch and reflect the light beautifully. The other two pieces I finished this week are in traditional autumn tones. This fringed triangle scarf is worked in a silky ribbon-style yarn the features shades of brown, bronze, peach and lavender. The photos really do not do justice to the colors. Finally, I made some additional acorn earrings. This time I used earthy autumn-toned beads and antique gold metallic thread to create multiple loops cascading from the caps. I did not paint the caps, but only gave them a light coat of a lacquer that has just a hint of sparkle. Tonight, it's time to start a new project. I like to have the television on while I work, but I can only watch things that I know well -- don't have to pay much attention to keep up. Having grown up as the oldest of seven children, working in dead silence is impossible for me. I need the comforting background noise. So which will it be Leave it to Beaver re-runs or Star Trek Next Generation (I own the complete series of each). Very different choices from very different times, I know ... I'll have to ponder on it. When I first began this blog, I talked about why and how I chose the name of Gossamer Tangles for my business. At the time, it never crossed my mind that people might be confused by the word "gossamer". I guess that as a child who dreamed of fairies, "gossamer" was just always part of my vocabulary. Doesn't everyone know that fairy wings are made of gossamer? Apparently not. Over the last few weeks in setting up a new bank account for my business and dealing with various agents of the bank, I was reminded that many people just are not familiar with the word "gossamer". In the past, I've had a few people think it was someone's name (usually last name, sometimes first). But every person I dealt with at the bank pronounced the word incorrectly, and none had a clue as to what it meant. It is probably an ill omen for my business that people don't recognize a key term in the name, but at this point, I'm not going to through the very burdensome task of trying to change the name. Plus, I love the word "gossamer", and I've become emotionally invested in the name I chose. So, I thought that in today's blog post, I would take a moment to provide a little vocabulary lesson. Hopefully, it may help others to come to know and love "gossamer" as much as I do. a fine, filmy cobweb seen on grass or bushes or floating in the air in calm weather, especially in autumn. a thread or a web of this substance. an extremely delicate variety of gauze, used especially for veils. something extremely light, flimsy, or delicate. Merriam-webster.com provides the adjective definition: "extremely light, delicate, or tenuous". You may see the fairies riding. has come to show you wondrous things! To me the word "gossamer" has always conjured images of delicacy and light ... a whispered promise of something enchanting. That is the impression I strive to create with the "tangling" of the tiny threads and shimmering wires that make up many of my jewelry designs. This week, I completed an infinity scarf of my own design that I hope conveys a "gossamer" quality. The yarn I used is very light, with a slight halo quality to it. The yarn mirrors the colors of a moonlit night sky, with deep shades of blue and subtle glints of metallic silver, like stars peeking through clouds. It was stitched in a very open, trellis-type stitch pattern. I live in a neighborhood blessed with huge, majestic oak trees! At this time of year, the ground is littered with acorns, and especially acorn caps (after the squirrels run away with the nuts). Those cute, round little caps just seem to cry out to me as I walk the pugs, "Use me! Use me!". I pick up the nicest ones, put them in my pocket, and then day dream about what I can create with them for the rest of my walk. 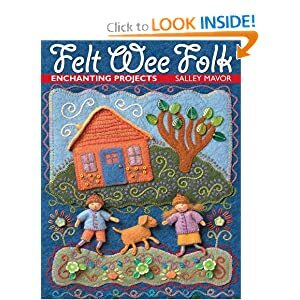 Several years ago, I found a beautiful, imaginative book, Felt Wee Folk: Enchanting Projects by Salley Mavor, that I fell in love with! It has the most wonderful ideas for using wool felt, embroidery threads, beads, and all kinds of items to create adorable items featuring "wee folk". The wee folk wear acorn caps on their heads! Using the ideas from this book, I crafted some unique flower fairies for my nieces for Christmas that year. Of course, they wore acorn caps. I wish I would have photographed them, but it never crossed my mind at the time. This week, I decided to try incorporating acorn caps into my Gossamer Tangles jewelry. I came up with two earring designs featuring the caps and wire crochet with beads. I decided to paint the acorn caps with metallic paint before using them. For the teal/green earrings, I made a small hole in the middle of the acorn cap to thread the wire through and attach the drop to the earring wire. In case any of you are thinking of trying this, a warning -- it is very difficult to make a tiny hole in an acorn cap without cracking it! 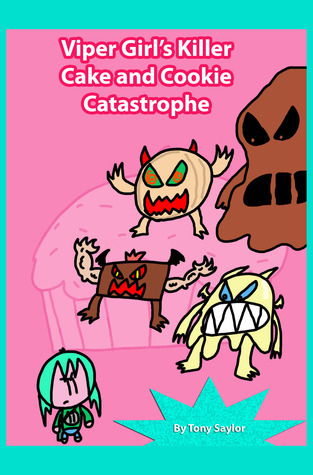 These little gems are surprisingly hard. I used a very small nail and hammer to accomplish it, but broke a few in the process. If you had a drill with a very tiny drill bit, and worked with minimal pressure, that would probably work better. I think the technique I used for the second design, in sort of a taupe/eggplant shade with bronze, probably works a bit better. I made a small, multi-petaled cap with a loop on top that I crocheted from wire. I attached that to the acorn cap with a strong, clear glue. Now that I have my stash in hand, I will be trying some additional acorn cap designs before the holidays. I also made another floral brooch early in the week -- thought I'd include a photo of that as well. Viper Girl Book Giveaway Contest! In a recent post, I mentioned my son, Tony Saylor's, two books, Viper Girl vs. 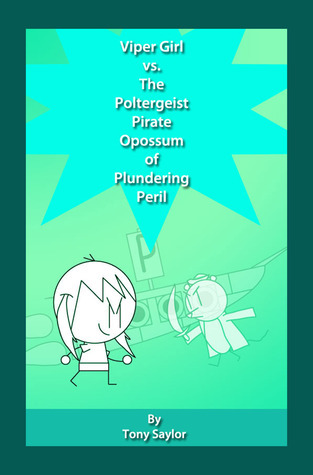 The Poltergeist Pirate Opossum of Plundering Peril (Viper Girl #1) and Viper Girl's Cake and Cookie Catastrophe (Viper Girl #2). For those of you who may be interested, you can now enter to win a free copy of either or both books on GoodReads.com! The contest runs through October 30, 2012. Just click on the links below to enter! Good luck! Giveaway ends October 30, 2012.